Those looking for Christmas stokings personalized patterns should look no further than our Santa Claus cross stitch design, a sampler pattern that would be perfect for your kids personalized Christmas stocking, or part of your Christmas cross stitch project. This stitching chart is also great for personalized Christmas cards. You can easily stitch this pattern onto an Aida or evenweave clothing material. Follow the instructions on e-How on how to make personalized Christmas stockings for this holiday season. 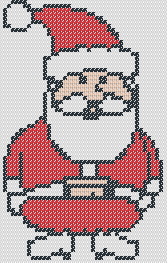 Download Christmas Santa Claus Cross Stitch Pattern zipped file (approx. 256kb — downloaded 197 times). The password for this download is “crossstitch4free” without the quotation marks. Christmas stockings personalized for your loved ones are not only personal, but also serve as affordable presents. Personalized Christmas stockings for kids in particular would be best, because as they get older, these stockings can be made as part of their memory scrapbooks, making them much more special. Make sure to use our cross stitch letters design to add a special touch to your Christmas stockings. If you are searching for more free cross stitch patterns related to Christmas or cross stitch alphabet fonts? Just use our Search form on the top of this page and enter those words. Or, you can scroll to the end of this page and click on the word “Christmas” in the Related Keywords list. This cross stitch chart as well as as all our other cross stitch patterns can be mixed and matched to suit your cross stitching project need. Take the time to subscribe to our updates either via e-mail or RSS feed (link can be found at the bottom of this site) to get instant reminders of the many more free cross stich patterns we have in store for you. Please send us a message via our Contact page immediately if you find any problem with our site or cross stitch design downloads.